SILICON SLOPES, Utah — December 2, 2015 — Domo today announced that customer SABMiller, one of the world’s largest brewers and beverage distributors, has been named the winner of Ventana Research’s prestigious 2015 Business Technology Leadership Award in Business Analytics. This award recognizes SABMiller’s trailblazing use of technology and teamwork to understand, collaborate with and act upon data in real-time and make crucial decisions that benefit and lead the global enterprise. SABMiller will be presented with the award during Ventana’s Leadership Awards Webcast Ceremony on Dec. 3, 2015. 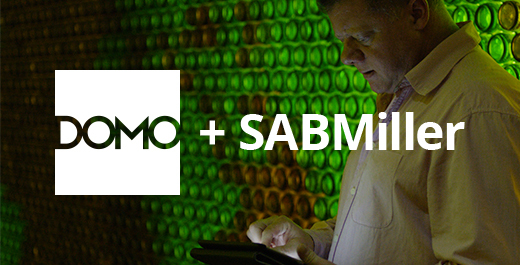 SABMiller’s digital marketing organization, in partnership with Domo and WPP marketing technology consultancy, Acceleration, pioneered the development of a Global Digital Reporting Platform (GDRP), a groundbreaking project designed to drive comparability and visibility of marketing data across SABMiller’s 200-plus brands in more than 80 markets. The GDRP, built upon Domo’s cloud-based business management platform, was launched across five regions, incorporating close to 800 sources of data. Leveraging the Domo platform, SABMiller, for the first time, can compare data from any source for any brand such as Facebook, YouTube, Twitter, Instagram, Google Analytics, display advertising and other key marketing channels. As a result, SABMiller’s brand marketers have been able to collaborate to improve the effectiveness of their global and local spend, enhance business outcomes and improve the way they interact with social media followers. To hear more insights behind this recognition, register for the Ventana Research Awards webinar on December 3 at 9:30am PT / 12:30pm ET via http://www.ventanaresearch.com/Leadershipawards/. For more information, visit www.domo.com. You can also follow Domo on Twitter,Facebook, LinkedIn, Google+, Instagram and Pinterest.